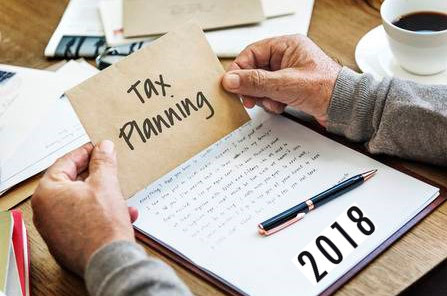 Once again, the season for tax planning is upon us … and this year with a number of challenges for both businesses and individuals. The primary driver is the changes brought about by the passage of the Tax Cuts and Jobs Act (TCJA). On balance, most taxpayers, both businesses and individuals, will enjoy tax savings under the new regulations. Nevertheless, end of year planning is critical to maximize your benefits and minimize your tax bite. End of year tax planning for businesses will include the need to factor in … reduced tax rates for C corporations; elimination of the corporate alternative minimum tax; allowance for a 20% deduction for individual owners of certain proprietorships, partnerships and S corporations; and accelerated up-front write-off for an ever-expanding group of business assets. Among the changes affecting individual taxpayers include doubling the standard deduction, elimination of personal exemptions, and numerous itemized deductions reduced or eliminated. Our objective is to summarize the revised tax law provisions and prompt you to seek guidance from your tax advisor to determine the specifics as it pertains to your unique circumstances. Certainly, that may be a prudent step on your part as the tax code adjustments likely will affect your strategies to maximize benefits under the new law for you and your family. This article is intended only as a review of the new law’s highlights. The details are beyond the scope of this piece so seeking advice from a professional tax expert is advised. Now, as promised, let’s examine the tax rates, tax deductions, exemptions and tax credits provided for in the Tax Cuts and Jobs Act for both individual taxpayers and businesses. 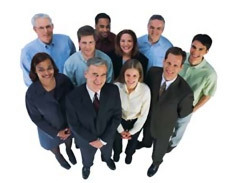 Pass-through business deductions – up to 20 percent of business related income; applies to partnerships, S corporations and sole proprietorships with some limits and exceptions. Deduction phases out for certain professional service individuals – starts at $315,000 for joint return filers and $157,000 for all other taxpayers. Section 179 deductions for depreciable personal property permitted in one year rather than amortizing over several; maximum amount increased to $1 million per year. Bonus depreciation now available on both new and used property. Vehicle depreciation cap is increased and indexed for inflation; new limits are $10,000 (year 1); $16,000 (year 2); $9,600 (year 3); $5760 per year thereafter until cost is recovered. Entertainment expenses – 50 percent deduction of business-related food and beverage expenses retained; no deduction for entertainment and membership dues. Corporate interest expense deductions limited to 30 percent of income. Note: Most individual changes are effective January 1, 2018 and will expire at the end of 2025. Unless Congress passes another law prior to then, the old tax code provisions will be reinstated. The Act retains the seven income tax brackets of the previous tax code, but with reduced tax rates for individuals in all brackets but one. The net effect of these reductions were realized by most employees as employer payroll withholding was reduced … resulting in increased take-home pay beginning with their February 2018 paychecks. Note: Capital gains rates remain unchanged under the new law. 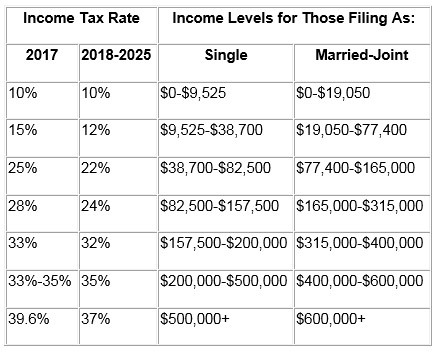 Standard deduction doubled from $6,350 for single filers to $12,000; married and joint filers increased from $12,700 to $24,000. This, coupled with the changes to itemized deductions, is likely to lead to more taxpayers taking a simplified approach to filing, i.e. electing the standard deduction. Home equity loan interest eliminated unless used to buy, build or substantially improve the taxpayer’s home that secures the loan. Deduction for medical expenses increased to 7.5 percent or more of income in 2017; 10% in 2019. When compared to tax deductions, tax credits yield the better tax savings. Tax deductions reduce the amount of your income subject to tax. Tax credits directly reduce the tax itself. For example, assume you or your business spends $5,000 that results in a tax deduction. That will reduce your taxable income by $5,000. In a 25% tax bracket, you would save $1,250 in taxes. Now compare that with a $5,000 tax credit. That amount is subtracted from the amount of tax owed as opposed to an offset to income … as is the case with a tax deduction. Result: Your tax bill is reduced by the full $5,000 tax credit! Credit of $500 for each non-child dependent. Again, the tax code revisions likely will affect your strategies to maximize benefits under the new law for you and your family. Our objective is to summarize the new provisions and prompt you to seek guidance from your tax advisor to determine the specifics as it pertains to your unique circumstances. Alternatively, a time-saving and less stressful approach is to give us a call or drop an email to schedule a time to review the specifics of your unique situation and develop an optimum tax strategy that benefits you and your family. With the new tax code as the frame of reference, we stand ready to help you with traditional end-of-year tax strategies that include deferring income to a later year and accelerating deductions into the current year. The TCJA may deliver on a number of additional benefits to you, your family and/or your business. Previous post MARKETING ON A SHOESTRINGNext post BETCHA DON’T HAVE ONE!